Today we are excited to be CASE-ing (Copy & Selectively Edit) Tracy May, who is also joining us on this hop! How exciting! I hope you find great inspiration from all the projects in this hop. You may be starting the hop here at my blog (Jessie Holton) or you may have come from the previous person on the list. Be sure to click on the next person in the list to continue your blog hop adventure casing Tracy's work. Here is the card I have chosen to case from Tracy! I just LOVE the Fairy Celebration stamp set.Click here to see Tracy's blog post for this card. I haven't taken a very literal CASE of Tracy's card, but just took inspiration from the fairy. I made a similar card in my previous post, but this one is a little more jazzed up & I have made it in a bunch of different colours. For the first few, I have used the specialty copper embossed paper from the Affectionately Yours DSP. 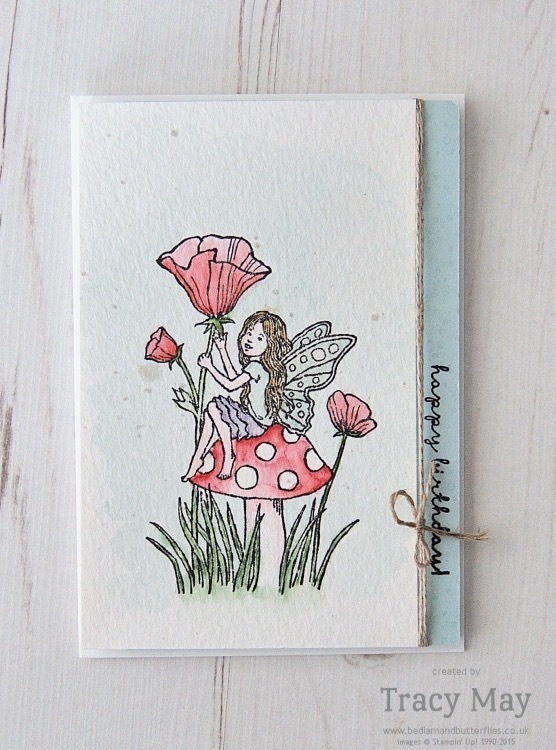 The little fairy is stamped in Pink Pirouette & is from the Fairy Celebration stamp set. I have used Watermelon Wonder embossed with Iridescent Ice (retired) for the fairy dust. In order to do this, I have first inked up with Versamark & then inked up with Watermelon Wonder on top, then sprinkled with the heat emboss powder & set with the heat tool. 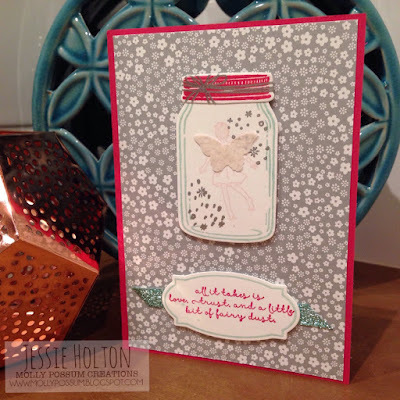 I have also used Watermelon Wonder embossed with Copper (bow stamp) for the lid. The sentiment is also embossed in Copper & is from the Fairy Celebration stamp set. The label stamp comes from the Rose Wonder stamp set & the matching framelit comes from the Rose Garden framelits. I have also heat embossed retired Iridescent Ice onto Vellum with the small butterfly from the Papillon Potpourri stamp set & cut out with the matching Bitty Butterfly Punch. I love that SU coordinates all of it's products so they fit perfectly together! Lastly, I have added a length of the new Mint Macaron Sheer Linen Ribbon under the sentiment. 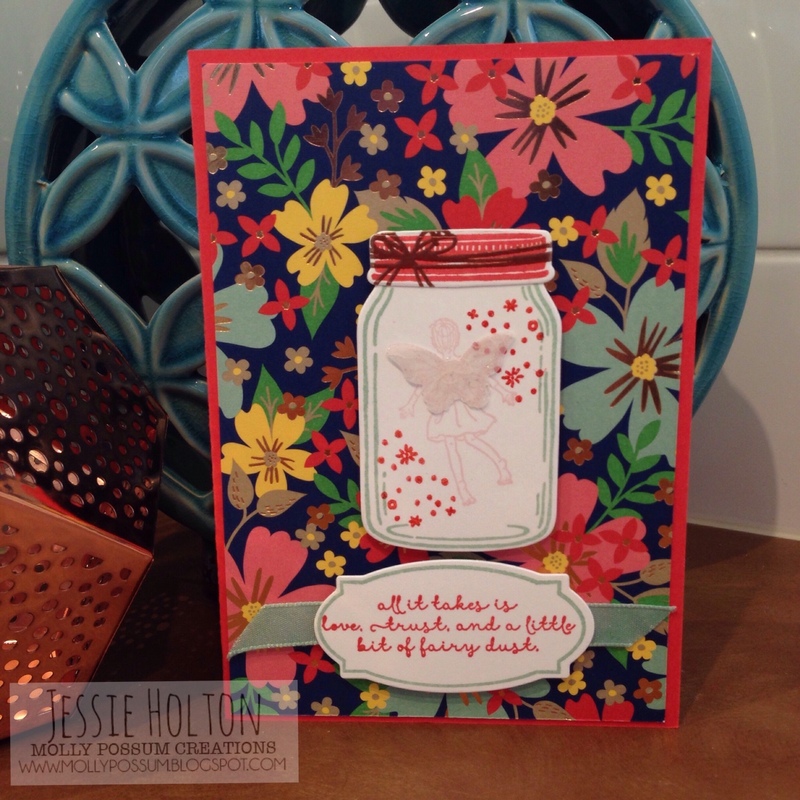 The jar & lid have been cut out on the Big Shot using the Everyday Jars framelits. The sentiment & the jar are propped up on Dimensionals. Here's a Mint Macaron, Watermelon Wonder & Copper heat embossed version. I just adore this craft & copper paper! And a Pool Party & Copper version, using Pool Party ink with the retired Glitter Ribbon from the Occasions catalog. And Copper heat embossing. For these next few, I have used the Neutrals Designer Series Paper Stack. This one is Crumb Cake, Mint Macaron & Watermelon Wonder. Here's a Pool Party, Watermelon Wonder & Soft Suede version with Copper heat embossing. Here's a Pool Party, Watermelon Wonder & metallic Silver version with Silver heat embossing. Did you guys know that you get 4 sheets of metallic gold & 4 sheets of metallic silver at the back of the Neutrals DSP stack? Awesome!! Here's a Bermuda Bay, Pool Party & Soft Suede with Copper heat embossing version. And lastly, a Silver, Bermuda Bay & Pool Party version with Silver heat embossing. 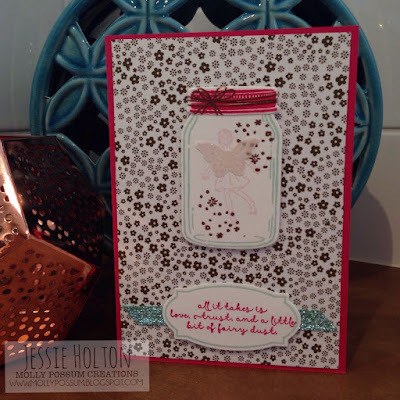 Click here to follow the Blog Hop around & see all of our Team's cards, inspired by Tracy! Stampin' Up!® have just realised and INCREDIBLE promotion for July and August! 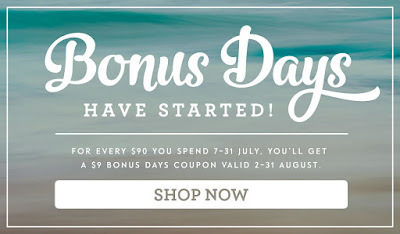 For EVERY $90 you spend this month (July) you will get a $9 coupon emailed to you to use in August! 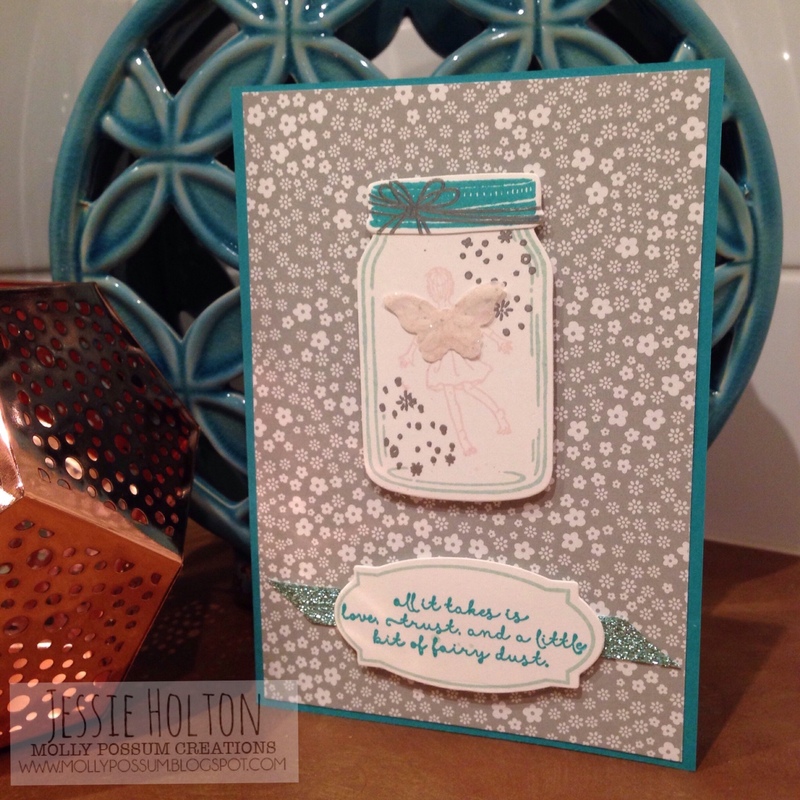 Fairy in a jar, that really says it all! Pretty and sweet. Really pretty cards Jessie - love them all. 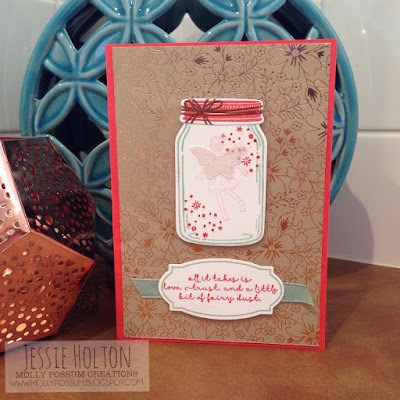 Love the look of that copper embossed Kraft DSP! I'm so happy to be hopping with you today! OMG so many gorgeous cards! Oh Jessie, this is really cute!!! I'm so glad I ordered the jar set. Cant' wait to play with my set. The embossed DSP works on this card like magic! 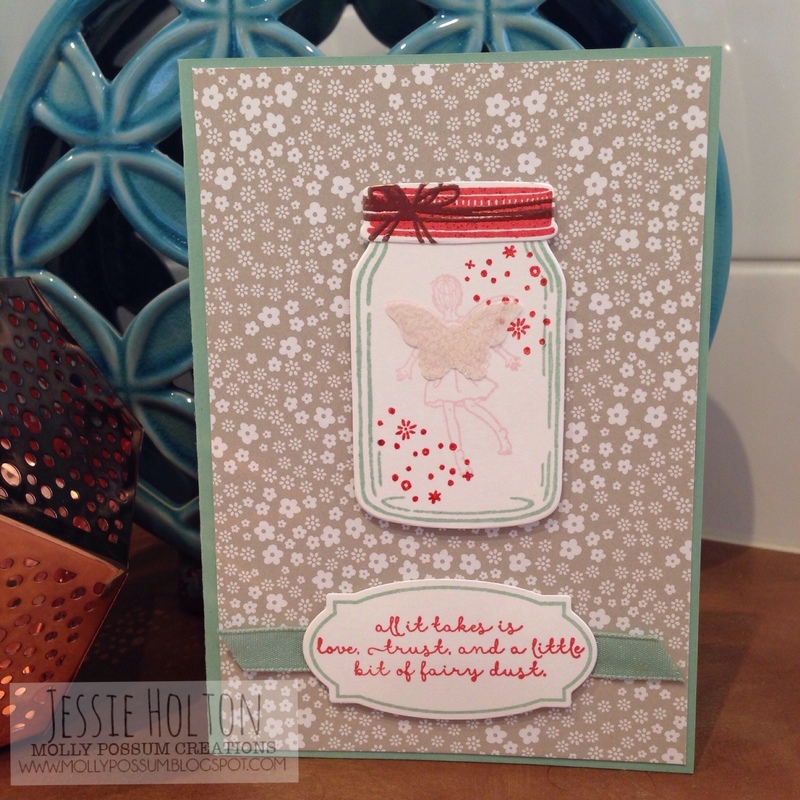 Love your use of the stamp set with the Jar Of Love Bundle, very clever Jessie! Great cards. How sweet life would be if we could capture our own fairies to keep. Super cute cards Jessie. Love all your variations.